Visceral Games' follow-up to the original Dead Space was only recently announced by EA. Today, we have our first look at Necromorph dismemberment expert Isaac Clarke in Dead Space 2 and maybe some of his new talents. 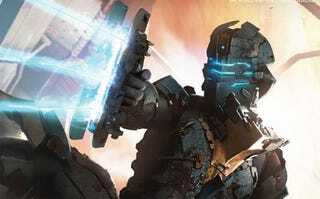 The newest issue of Game Informer offers new details on Dead Space 2, but none that have been revealed outside of print yet. We're anxiously awaiting the US Postal Service's speedy dispatch of our own issue, hopefully bearing good news. The full version of the cover shows Isaac sporting some serious jet booster action at the knees, a move I certainly don't recall during my playthrough of the original Dead Space. Could flying strategic dismemberment be added to the sequel? And would that make for good multiplayer? If Visceral were to add some Left 4 Dead-style multiplayer and co-op action, letting us take on the role of Nectomorphs online, that could be pretty neat. Don'tcha think?